and many well preserved Victorian and Georgian buildings. Founded in 1806, Launceston is the Australia's third-oldest city, with a fascinating history traced in its beautiful old buildings and streetscapes dating from early Colonial and convict times to Georgian and Victorian eras. Its many well preserved Victorian and Georgian buildings, together with its diverse collection of art-deco architecture, give the city an unusual period ambience. The architecture of the mid-to-late 20th century that dominates most large modern cities and many smaller ones, is quite rare and a walk around the city leaves one with the feeling of being wrapped in a timeless cocoon of yesteryear. 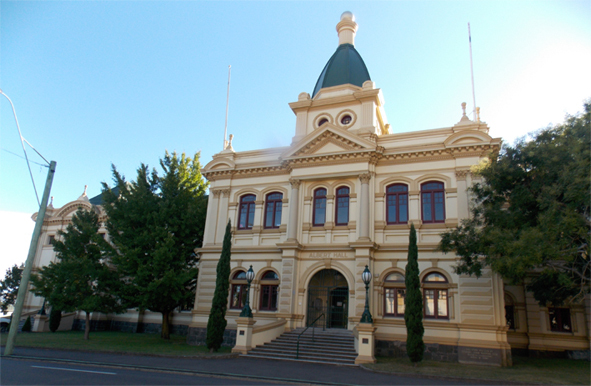 Greater Launceston has a population of 106,153 (2011 census) and the charm and pace of a regional centre, with the facilities of a much larger city. This map, showing streets, traffic direction, malls, parks and car-parks, is free to download to your device or print. This (external) link will take you to accommodation, attractions, dining, events, shopping and tours in Launceston. Treasure Island Caravan Park - 94 Glen Dhu Street Launceston. Free for Registered Guests or fee for dump point use only. external link, above, contains a list of doctors and medical centres in and around Launceston, including address, phone, opening hours and map. This (external) link will give you updated details of property for sale in greater Launceston. On the 14th October, 1804, Lt Gov. Paterson embarked for Van Diemen's Land on the Buffalo at Sydney Town and with a party of soldiers proceeded to his command of the intended establishment at Port Dalrymple. The first encampment was at Outer Cove (now George Town), but the lack of fresh water, exposure to the wind and infertile land persuaded Paterson to move the settlement to York Town, upstream on the western bank of the Tamar in early 1805. Here fresh water seemed to be in abundance, and the land well suited to both cultivation and grazing. Winter proved this spot to be less than ideal and in spring the farms and gardens of the inhabitants flooded, and many of the Bengali cattle, transported from a warmer climate, died of exposure. It was for this reason that towards the end of 1805 the settlement was moved to Launceston, which was selected for its sheltered position, abundant green pasture (comparing favourably with the Hawkesbury), and the sparseness of its lofty trees. The matter did not rest here, because Governor Macquarie, during his term in office between 1810 and 1821, decided that the settlement should after all be situated at George Town where it was more accessible. This indecision retarded Launceston's growth until the 1820s. Initially the settlement was called Patersonia after commandant of the British garrison Lt. Col. William Paterson, who later served as Lieutenant-Governor of northern Van Diemen's Land from 1804 to 1808. He later changed the name to Launceston in honour of the New South Wales Governor Captain Philip Gidley King, who was born in Launceston, Cornwall. Launceston [is] in the parish of Launceston and county of Cornwall, is the second town of the colony, and is in lat. 41°. 24'. S., and lon. 147°. 10'. E.
It stands at the confluence of the North and South Esk rivers, which here discharge their waters into the Tamar. It is 121 miles (195 km) from Hobart, and 40 miles (64 km) from the sea at Port Dalrymple. On the east and west it is bounded by hills, and on the north stretches the valley of the Tamar. The town is well laid out, and viewed from the hills which overlook it, or from the Tamar, it has a picturesque appearance. The wharves, which afford accommodation to vessels of large tonnage, extend along the river which forms the northern boundary. Farther up are numerous spacious stores and other commercial buildings. There are two large episcopalian churches, a handsome presbyterian church, a Roman catholic church (all built in the Gothic style), a Wesleyan chapel, two congregational chapels, a free church, a baptist chapel, and a synagogue, all neat and commodious buildings. The court house, the gaol, the house of correction, female factory, and several other government establishments, are large and well-built. Many of the shops, offices, inns, and private buildings are of considerable size and respectable appearance. On the hill which bounds the town on the eastern side, and commands a splendid view of the town and river, are many private residences and gardens. There are four banks, four insurance offices, three printing establishments, and two bi-weekly newspapers. The principal public offices are the police office, the custom-house, the post office, and the port office. The population of the town is 10,855, the number of houses, 2,181; 798 of which are of stone or brick. There are an episcopal grammar school, a Wesleyan day school, an infant school, three episcopal day schools, a catholic school, seven Sunday schools, and numerous private schools. The public institutions, besides the banks and insurance offices, are a mechanics' institute and reading room, a library society, several circulating libraries, two horticultural societies, a benevolent society, auxiliary bible society, two masonic lodges, odd fellows society, rechabite society, and a teetotal society. There are 70 vessels belonging to the port, their collective tonnage being 8,564 tons. There is also a floating dock. Richard Dry, Esq., the hon. the speaker of the Legislative Council, is the first member for the electoral district of Launceston. Launceston offers a great variety of things to see and do and I have offered just a few here to get you started. The Cataract Gorge Reserve covers 192 hectares and is home to a wide variety of plants and animals that live in the bushland and waterways and make up this a magnificent treat for locals and tourists alike. It has numerous walking trails with lookouts, as well as the world's longest single span chairlift, a suspension bridge, an open air swimming pool, a children's playground, free barbeques and picnic lawns, the Gorge Restaurant and Basin Cafe (which serve the finest Tasmanian produce and have magnificent views of the Reserve). In the Cliff Grounds there's a band rotunda with historical information, exotic deciduous trees, azaleas and rhododendrons and peacocks strutting about the graceful Victorian gardens among towering conifers. The gardens were designed in the style popular in Victorian England at the time. It is also a collector’s garden, with trees and other plants from all over the world planted there, as the European settlers still had nostalgic yearnings for the gardens of their homeland and is the reason why, in the 1890’s, they tried to recreate the places that were familiar to them, including the decorative peacocks that were introduced and that still roam the grounds along with the native wallabies that can be seen grazing on the lawns alongside them. Driving south out of Launceston, on Hobart Road, you will find this magnificent home to your left and it is well worth a visit. Franklin House, constructed of Australian cedar, was built in 1838 for Britton Jones, a Launceston brewer and innkeeper and is maintained and operated by Australia's National Trust. Franklin House is open to visitors between 9am – 4pm Mon – Sat (April to Sept), 9am-5pm (Oct to Mar), Sunday Noon – 4pm and is closed Christmas Day, Boxing Day, New Year’s Day & Good Friday. Paterson Street, Launceston - at the head of the Tamar River. This restaurant, cafe and gallery complex sits on the edge of the CBD and is easily accessible by car or foot. The mill itself was considered a fine establishment - operated by a race from the wild Cataract Gorge, it had stores holding up to 10,000 bushels of wheat, a five bedroom brick cottage and other out buildings. Mr. George Yates bought a share of the water mill in 1845 for 4400 pounds. In 1847 Mr. Yates offered his Supply Mills, on the Supply River, for lease and it was taken up by my great-great grandfather, James Cartledge and his brother, John. 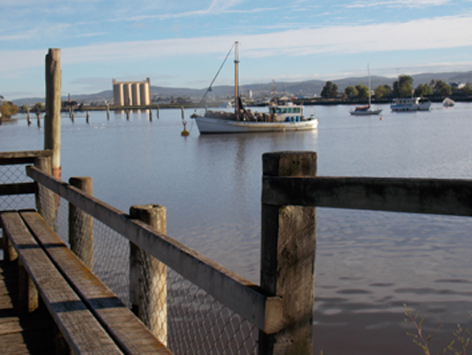 A little later in this work we will be visiting the heritage listed, Supply River mill site, further up the Tamar. While the milling operation seems to have been a little less than profitable for Mr. Yates, it was the income from the water supply, estimated to exceed 1500 pounds per annum, that was ‘The El Dorado of Launceston’. The Cartledge brothers grabbed a piece of the action, purchasing water from the mill-race and on-selling it, from a tanker, to the ships in the harbour. "J and J. Cartledge respectfully inform masters and owners of vessels that they have purchased the Union Water Tanks, by which the shipping are supplied with pure unadulterated Cataract water at the very lowest possible price. They also respectfully inform masters and mates of vessels that the Union is the only water tank supplying shipping that can get pure cataract water, as all others are compelled to procure a supply from the river in the immediate vicinity of the filth and dirt from the sewers and cesspools of the town, or where the public are accustomed to bathe." Carters paid the mill sixpence a cask and by the time it reached residents it ranged from eighteen pence to three shillings (thirty-six pence). 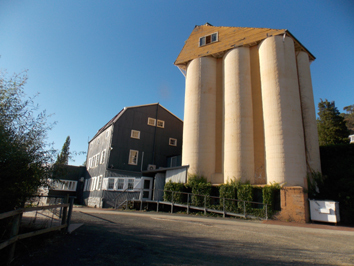 In the late 1970s, the mill was bought by the Tasmanian Government for an art gallery and craft centre with restoration work undertaken, funded partially by the Government and the Launceston City Council. The Mill became home to the multi award-winning Stillwater Restaurant, River Cafe and Restaurant in 2000 and a couple of years later, the Mill Providore Gifts and Gallery was established on the two floors above the restaurant. Back in around 1979/81 (sorry about the memory) the centre decided that it wanted a paved area at the entry to the building and its lack of funds caused it to come up with a most exciting and practical fund-raiser - a part of which still exists today. 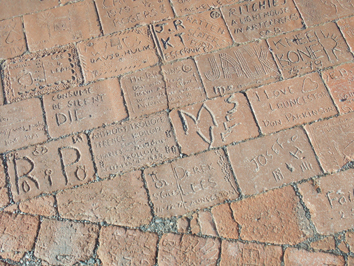 A fete was held and the people of Launceston were invited to leave their mark on one or more unfired pavers, at a cost that would pay for the end product and its installation. The offer was taken up by many, including me, my (then) partner and our kids and I have recently revisited to have a look (and take the above photo). The pavers represent a wonderful time-capsule of thirty-five odd years ago. Established in 1891, it is now the largest museum located outside a capital city in Australia. The Queen Victoria Museum and Art Gallery is located at two sites across the city: the original purpose built building at Royal Park and another at the Inveresk Cultural Precinct, on the grounds of the former railway station and rail yards in buildings largely converted from the former Railway Workshops. The precinct also includes the Launceston Tramway Museum, which houses the No. 29 tram, the 'Mary St' shelter shed and a host of other memorabilia. The state's largest preservation railway, the Don River Railway, also has a carriage rebuilding workshop on the site. A.W. Birchall & Sons (Birchalls) dating from November 1844, is still located at its original site in Brisbane Street. Grab yourself a picnic lunch and spend an hour or so exploring this beautiful parkland that features mature trees and shrubs, a display of annual flowers, a Japanese Macaque monkey enclosure, the John Hart Conservatory, a duck pond, senses garden, monuments, chess board, historic Albert Hall, barbeque area and a children's playground. City Park, originally developed by the Launceston Horticultural Society and handed over to the Launceston City Council in 1863, was once called the 'People's Park', which reflects how the park has been viewed by the people of Launceston since its beginnings.